Add a truly dramatic and lasting home to your bird garden with the Wing and A Prayer Classic Bluebird House with Merlot Red Roof. The vivid white body and deep red roof lend a classic look to this home, while the modern materials offer durability. The item's tall, main body is crafted from durable, square PVC tubing, and creates plenty of room for a bluebird family. This robust material will not mold, mildew, rot, or delaminate, retaining its shine and integrity for many seasons. A 1.5" diameter entry hole rests on the front of the house, and PVC trimboard surrounds it for depth. This trim acts as a predator guard, preventing raccoons from reaching into the nest, and a red piece of metal atop the guard keeps squirrels and woodpeckers from enlarging the hole. A dramatic, four sided metal roof covers the house, with a deep red, merlot-inspired finish adding an elegant touch. A wooden frame beneath the metal roof ensures strength and stability, and this top can be removed for seasonal cleanings. Place the included white finial into the opening at the top of the roof for extra height and to complete the unit. The finial removes with ease for quick nest checks, and helps the home stay ventilated for nestling safety. Wooden blocks keep the floor in place at the base of the home, and elevate the nest from the floor to protect it from captured water and parasites. An extended platform around the base of the home creates places for bluebirds to land without a perch, and an attached collar allows the item to mount onto a true 4" x 4" post (not included). 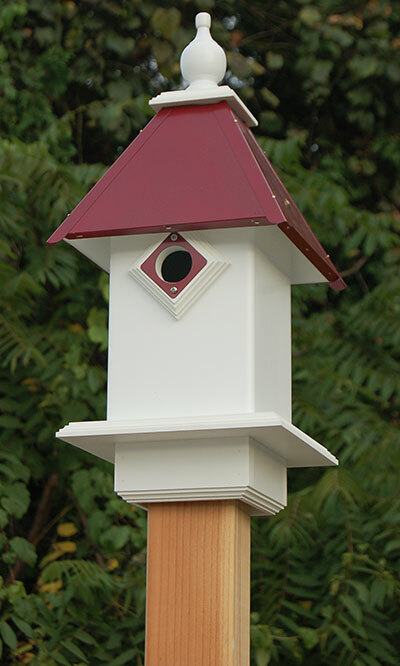 Create a fantastic look in your bird garden with this Classic Bluebird House with Merlot Red Roof. Made in the USA.